Lately, the stress of having to constantly keep his destructive power under control is causing the Red King Mikoto Suoh to become unstable. Meanwhile, Reisi Munakata is chosen by the Dresden Slate to become the new Blue King. Ahhh, it is so good to finally have K back and studio GoHands to return back to it's former greatness. Hand Shakers was an absolute downgrade of everything GoHands has created. It has been several years since the last K anime came out and I got to admit I missed it a lot. 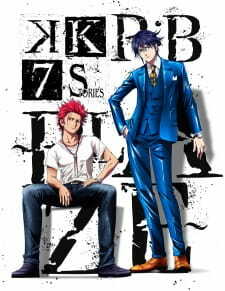 Seeing how it all started with Suoh and Munakata really made me reminiscent. Making us the viewers understand Each of their ideologies just in one hour episode is usually hard to accomplish, however the studio and director do a good job of that. A very exciting story, which by the end of movie 1, makes me want even more. The art in K is TOP NOTCH, I would compare it to the quality of the Fate series and OPM from Madhouse. The atmosphere is vibrant and the character design design is really well made, the fight animations are fluid and I cannot see any flaw in this department. You can see the love of the studio for this anime. What can I say about the sound, this anime has an incredible OST, but the first thing that made me watch it, was the Seiyuus. I mean are the best seiyuus in the industry, aside from Ootsuka Akio and Kamiya Hiroshi, you have Tsuda Kenjirou, Sawashiro Miyuki, Sugita Tomokazu, Miyano Mamoru, Jun Fukuyama and the list goes on with indrustry heavyweights. As always the music is provided by Angela. It is a definite must watch, if some people nitpick they can find a flaw in something, but for me the only downside was that it was only 1 hour. It felt like five minutes, the incredible visuals, godly voice acting, story progression and characters really hood you in the world of K.